Maduro won the Venezuelan presidential elections Sunday, gaining a second term for six years with over 5.5 million votes. 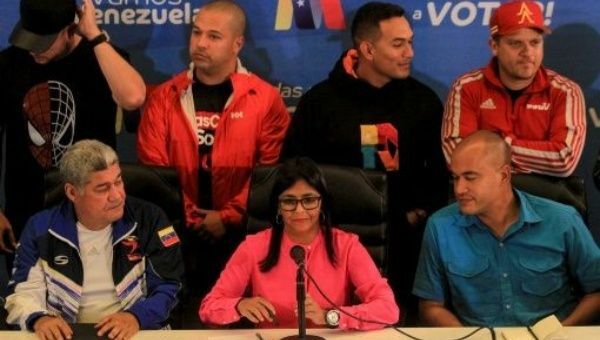 May 20 (teleSUR) Delcy Rodriguez, the President of Venezuela’s National Constituent Assembly, said the calls for an abstention in the country’s presidential election were defeated Sunday. With 92.6 percent of the votes counted, Maduro had 5.8 million votes, with his closest rival, former governor Henri Falcón getting 1.8 million votes, according to CNE President Tibisay Lucena who added that in total, 8.6 million Venezuelans voted, out of an electorate of 20.5 million people. “As president of the National Constituent Assembly, I’m very pleased with the civic behavior of the Venezuelan people. They have rejected extremist elements, violent elements, and those who have impinged against the constitutional order,” Rodriguez during a press conference. Maduro’s main competitor Henri Falcon, who had promised to change Venezuela’s currency, Falcon said he wouldn’t recognize the results, claiming that they were “illegitimate.” He blamed abstentionist sectors of the opposition for his loss and called for new elections to be called for October.